Here at Matthews Wall Anchor, we are always working to keep you safe. This is why we take traffic control and security in the gas well industry so seriously. In this industry, it is important to make sure that traffic is regulated carefully. This prevents dangerous accidents involving rigs, fracking equipment, or large trucks hauling equipment. That is where Matthews Wall Anchor’s professional traffic control systems come in handy. We are proud to provide traffic control services for the gas well industry in our service area. Our team knows exactly what is needed to keep the work area safe for all involved. 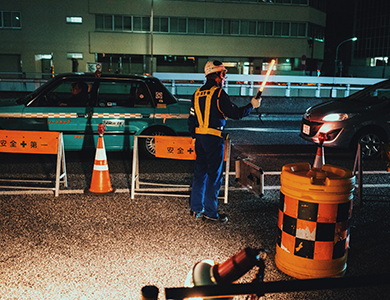 We offer our professional services to anyone in need of reliable and safe traffic control options. If you are in need of a quality, reliable, traffic control company to ensure the safety of all near the oil field, come to Matthews Wall Anchor today. This is just one of the commercial services that we provide to focus on your safety. Why Choose Matthews Wall Anchor for Gas Well Traffic Control? These services help ensure that any work zones concerning oil and gas remain safe for both the workers and passersby. We provide the most qualified personnel and highest quality equipment in the area. Contact Matthews Wall Anchor in Pittsburgh, PA to learn more about how we can help keep you safe.